Windows 10 - What you need to know. By now I am sure you have heard that the next version of Microsoft’s operating system is Windows 10. However, there is some confusion on what Windows 10 has to offer and what the cost of it will be. Below are some of the common questions people have about Windows 10. It is free for a limited amount of time to almost everyone. Here are the conditions you need to meet to receive Windows 10 for free. You need to be running Windows 7 SP1 or Windows 8.1. Your current operating software needs to be up to date before you can start upgrading your computer. Your hardware has to meet these minimum specs. If your computer is running Windows 8 or 8.1, you can run Windows 10. If you aren’t sure if your computer meets these minimum requirements – don’t worry. Microsoft will check your operating system to make sure your computer meets them. You need to be a home/small business user – not an enterprise user. Enterprises will still need to purchase Windows licenses just like before. How do I reserve my free Windows 10 upgrade? If you meet the requirements above, you should see a small “Windows Flag” on your taskbar. Click on the Windows icon and select “Reserve your free upgrade” when prompted. After you reserve your free upgrade, Microsoft will begin to roll out Windows 10 starting July 29th. Microsoft will offer the free upgrade for one year. When does Windows 10 become available? July 29 is the official release of Windows 10. However, you may not receive the Windows 10 upgrade till a later date. To avoid overloading Microsoft’s servers and to ensure a smooth release, Microsoft is releasing Windows 10 in “waves. The first people, besides the OEMs, to get Windows 10 will be the Windows Insiders. Windows Insiders are people that have been testing Windows 10 for months and understand Windows 10 and how the upgrade process works. The next group of people to receive Windows 10 will be the individuals who reserved Windows 10. Let’s say for some reason you missed the free upgrade to Windows 10 or maybe you want to build your own custom computer. How much money will it cost you to buy Windows 10? The cost for Windows 10 is the same as Windows 8.1 was. You will be able to purchase Windows 10 Home for $119, Windows 10 Professional for $199, and $99 for a Windows 10 Pro Pack to jump from a licensed version of Windows 10 Home. What if I purchase a new computer now? If you decide to purchase a computer today, you will be able to upgrade to Windows 10. Windows 10 is designed to run on devices that have Windows 8.1 installed. Does my Windows 10 computer need to be online to work? No. You can use your Windows 10 computer offline just like you could with previous versions of Windows. Naturally, you won’t receive any product updates while being offline. How will Windows 10 product activation work? Microsoft hasn’t released an official press statement about this yet. 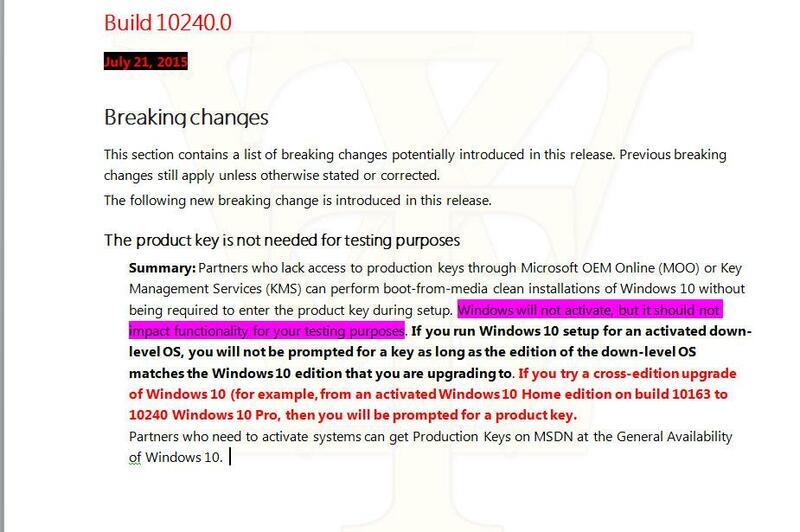 However, according to the leaks on WZor , if your current computer is running an activated version of Windows 7 or Windows 8.1 you will not need to enter a product key. Windows 10 will automatically be activated. If you try a cross edition upgrade, such as Windows 7 Home Premium to Windows 10 Pro you will need to purchase a product key. Will it remove my programs and files when I upgrade? The answer to this question will depend on your computer. If you run a Windows 7 SP1 or Windows 8.1 computer, you can do an in-place upgrade. An in-place upgrade, means you can run the Windows 10 installer from your existing operating system. During the upgrade process, Windows 10 will check your computer for conflicting drivers, software, and files. If Windows 10 finds something wrong, it will tell you want steps you need to take. You may need to uninstall some of your software, drivers, or antivirus to allow the upgrade to go smoothly. With all that said, once your computer has all the conflicts resolved you will be able to upgrade to Windows 10 and keep all your files and programs. You can find more information about potential upgrade issues on Microsoft’s blog. This is the big question, should I upgrade? Windows 8 was a disaster by many people’s standards. There were so many changes – no start button or start menu, weird start screen tiles that weren’t suited for mouse and keyboard use and an overall clumsiness getting around in the operating system. Naturally, this has made many people shy about upgrading to a different version of Windows. They don’t want to learn everything over again. The good news for you is that you won’t need to learn everything over again. With this version of Windows, Microsoft listened to its users and fans. Microsoft removed many of the frustrations that Windows 8 had. Windows 10 has a start button and a start menu. Just by adding those two features I feel makes Windows 10 is a worthy upgrade. Here are some more reasons to upgrade your computer to Windows 10. Windows 10 is fast. Since I am a Windows Insider I have been using Windows 10 for months already. I have found the Operating System to be very responsive and fast. I have a fast computer but even devices with lower specs should run Windows 10 well. Deep integration with OneDrive – If you are like the majority of people, you probably use some form of cloud storage; Google Drive, OneDrive, Dropbox, or Amazon Cloud. Microsoft’s OneDrive allows you to sync and store you files across all platforms and devices. In Windows 10, you can choose what you want to sync – all your folders or just certain ones. Overall, Windows 10 is more polished than it previous versions of Windows. Cortana – Microsoft has been making a big deal about Cortana, their virtual assistance, in Windows 10. I personally don’t find this a huge advantage since I don’t like speaking to my computer. However, I do know some of you love virtual assistances like Cortana. If you happen to be one of these people, you will love Cortana. She brings you the latest news, sets reminders for you, does web searches, gives you the weather forecast, traffic updates, sports scores and whatever else you want to know. Microsoft Edge – Microsoft’s Internet Explorer was getting quite outdated and slow compared to Google Chrome and Mozilla Firefox. Microsoft responded by building a new browser called Microsoft Edge. Microsoft Edge is fast and clean. Microsoft is also bringing extension support to its browser before long. This will allow you to run great extensions such as LastPass, Evernote, and AdBlock. Windows Hello – Windows Hello is a fancy term for biometric authentication. Windows 10 has a built-in support to authenticate your device by your face or finger. This will allow Windows 10 to be much more secure than a using a traditional password. Biometric authentication is very convenient – no longer do you have to remember a big long password. You can swipe your finger and you are logged in! To take advantage of Windows Hello your computer does require specialized hardware – such as a fingerprint reader and other biometric sensors. I hope this blog post answers you questions. If you have additional questions feel free to post them in the comment section below. If you need help updating your computer to Windows 10, please call us at 717-258-3789 or email support@Kirbtech.com. Once Windows 10 is released, Kirbtech will be selling new computers with Windows 10 installed. Give us a call and we would happy to find a computer that suits your needs.